Merry Christmas, one and all! 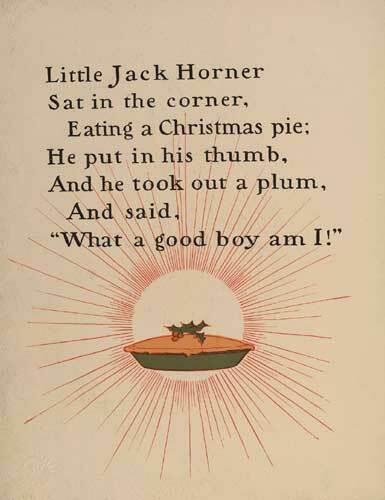 For the second year in a row, a Jack Horner Christmas pie post. Though this common nursery rhyme was first published in 1725, this image comes from William Wallace Denslow's Mother Goose, c. 1902. Whether your Christmas pie contains plums or not, I hope you have plenty, and that you don't have to sit in a corner to eat it (unless you have some magical cozy corner full of friends and family and stocked well with pie). From the Nothing-in-the-House kitchen to yours, much love and happiness, music and food to all of you this holiday season.